Teeth grinding is lateral movement of the jaw whilst the top and bottom teeth are in contact, rubbing the teeth together. It is often done in the form of a chewing action, but with no food in the mouth to chew on. In most cases teeth grinding is done during sleep, for this reason most teeth grinders are unaware of their habit. The medical condition of grinding your teeth is known as bruxism. 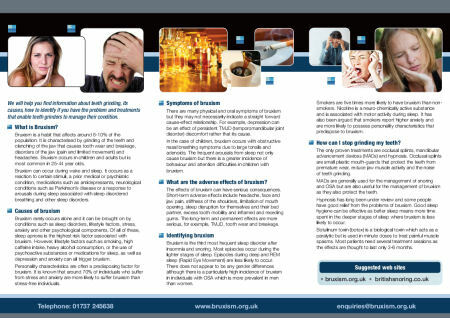 Bruxism can be split into two main behaviours, teeth grinding and jaw clenching. These two behaviours can occur simultaneously and different bruxers will exhibit differing proportions of these behaviours. If you believe you are grinding your teeth then you should also ask yourself if you are clenching your teeth, and look out for the other symptoms of bruxism. Teeth grinding has the potential to wear away the enamel from your teeth, eventually leading to exposed dentine (which is softer than enamel) after which the rest of the tooth will be ground away even faster. Damage to teeth is believed to be greater when teeth grinding occurs at the same time as strong jaw clenching. Grinding teeth whilst asleep can be much stronger than when awake and can cause a considerable amount of noise. This noise can disturb the sleep of the sufferer as well as their bed partner. As previously mentioned teeth grinding is a symptom of the sleep disorder, bruxism and therefore the treatments for teeth grinding and treatments for bruxism are one and the same. In short though, there are few treatments for teeth grinding with any clinically proven efficacy; in some cases hypnotherapy can help reduce or stop you grinding your teeth but in most cases the best that can be done is to control the condition by protecting the teeth by wearing a night-guard at night.